If you are looking for a new solution to tackle your painting tasks, then the Graco Project Painter Plus might be right for you. This product is highly convenient with a weight of just 15 pounds. Designed for small to medium-sized projects, you will be quite impressed with the available features of this model. Check out our full Graco Project Painter review to find out if this is the model you need. Who Has Graco Designed This Spray Gun For? Which Painting Jobs Is It Best For? How Does It Compare To Other Sprayer Models? One of the main concerns when painting around the house is the ease of setup and cleanup. The Graco Project Painter is made for even the beginner user. For cleanup, you simply have to attach the power flush adapter to the sprayer and cleanup will be completed in a breeze. You can also use the Project Painter to spray directly from your 1 or 5-gallon paint container with the Flexible Suction Tube. This means less time is spent on your project, getting you back to life faster. One of the other biggest perks this sprayer offers is that it only weighs in at 15 pounds. This makes it lightweight enough to take anywhere. With the included integrated storage system, you will find that using this sprayer on any job becomes a painless process. The Graco Project Painter Plus is also fully adjustable. This gives you the ultimate control over paint flow during any project. In addition, you no longer have to worry about clogs when you use the RAC IV SwitchTip. Simply reverse the tip and keep on spraying. When it comes to power, this little sprayer has some punch! It features a maximum pressure of 2800 PSI with a 3/8-horsepower motor. It is capable of spraying up to 0.24-gallons per minute and can be used with up to a 50-foot hose without losing any power. This sprayer comes complete with the SG2 metal spray gun, 515 RAC IV tip, a tip guard, a 25-foot hose, quick start-up guide and the operational DVD. The annual use recommendation from Graco is up to 50 gallons per year. This would indicate that the Project Painter is ideal for occasional household projects. 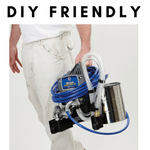 It is the ideal unit for a beginner who has never worked with a spray painter before. The easy setup and cleanup make it a breeze to get started on any project. Another great use for this sprayer is for property managers. If you have just a few properties to watch over and want to save money on hiring professionals, you could use this sprayer for light touch-up jobs. When working on household projects, you will find that this works ideally on your small to medium-sized tasks. You could easily accomplish a quick touch up to furniture or wooden toys because of the easy setup and cleanup. You’ll find that refinishing wood furniture or cabinets is also a simple process and much faster than using your brushes and rollers. If you need to stain your deck, this would be a time-saving tool to utilize. The Stainless Steel Piston Pump will allow you the flexibility to spray unthinned paints at high pressures. It is capable of spraying most any material if thinned according to the directions. If you need to reach tight corners or up to the second story of a building, the Project Painter Plus can support up to a 50-foot hose. Even when you’ve increased the hose to this level, you will notice that the performance does not diminish. When referencing other Graco models, the Project Painter Plus is on the lower scale of capacities. 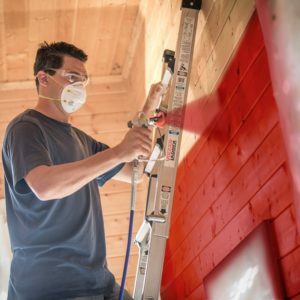 While it is ideal for the household do-it-yourselfer, it would not be the ideal sprayer to choose if you are a professional painter or contractor. If you still want to purchase a Graco model, but feel that you will need more in terms of power or capability, you may want to check out one of the other models they offer. For example, the Magnum x7 is able to spray at 0.31-gallons per minute and is recommended for usage up to 125 gallons per year. If you need top of the line, you could look at the Magnum ProX19 instead. This sprays at 0.38-gallons per minute with a recommended usage of 500 gallons per year. Obviously, this Project Painter Plus is lower cost than the other Graco options. If you don’t need a sprayer on a consistent basis, you may want to save yourself some money with this model. When compared to other sprayers of different brands, you’ll find that the HomeRight C800879 Power-Flo Pro 2800 is almost the same in specs and price. The biggest difference between these two models is that the HomeRight doesn’t come as highly recommended by reviewers. It also weighs several pounds more making it less portable. Yes, there are higher end models available for purchase, but you are going to invest more money into them. To determine if the Project Painter Plus is right for you, you’ll first need to determine how often you will need it. If you are only planning to do occasional household projects, this sprayer should be ideal for you. If, however, you have lofty goals of painting everything in sight, you might need a sprayer with more capability. I highly recommend checking out the other Graco sprayers that are on the market. They make many that are highly rated and worth the extra investment. Graco is a well-trusted name in the paint sprayer business and for good reason. They make a quality product at a reasonable price. If you are planning household painting tasks, the Project Painter Plus is a great option for getting your work done faster and cheaper.